Located right in the center of Tel Aviv, a short walk from the Tel Aviv beaches and the Herbert Samuel promenade. Liber Apartments offers luxury apartments. All the apartments are air conditioned and have a lounge as well as a full kitchen, a radio and a flat-screen satellite TV and free Wi-Fi access. The Dizengoff shopping area is only a short walk away and 30 minute walk from the hotel there's the Old Jaffa district of Tel Aviv, known for its many shops, restaurants, cafés and nightlife. -Grand Deluxe 60sqm Two Bedroom Apartment: Luxurious Two Bedroom Apartment designed and furnished in style and good taste. 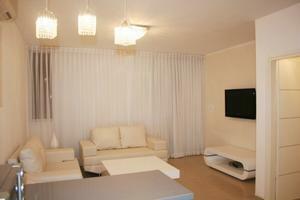 Beautiful Living room, fully equipped kitchen, TV with cables and Full air condition. Fresh linens and towels as well as bathroom amenities and WiFi internet connection are provided. Each Bedroom has a Queen size bed. Another Sleeping place is optional. The apartment is perfect for 4 people but can easily accommodate up to 5. Apartment's overall size is about 60 sqm. All expenses are covered in accommodation fee.It is located a few meters from the Tel Aviv seashore, close to the beach and the Hilton hotel. -Grand Deluxe 90sqm Two Bedroom Apartment: Luxurious Spacious Two Bedroom Apartment designed and furnished in style and good taste. 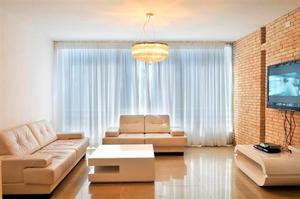 Beautiful Big Living room with a brick wall, fully equipped kitchen, TV with cables and Full air condition. Fresh linens and towels as well as bathroom amenities and WiFi internet connection are provided. Each Bedroom has a Queen size bed. Another Sleeping place is optional. The apartment is perfect for 4 people but can easily accommodate up to 5 Apartment's overall size is about 90 sqm. All expenses are covered in accommodation fee. The Apartment is located a few meters from the Tel Aviv seashore, close to the beach and the Hilton hotel. Located right in the center of Tel Aviv, a short walk from the Tel Aviv beaches and the Herbert Samuel promenade. The Dizengoff shopping area is only a short walk away and 30 minute walk from the hotel there's the Old Jaffa district of Tel Aviv, known for its many shops, restaurants, cafés and nightlife.